"The direct and indirect effects of cancer treatment can create, in some, a reinforcing pattern of avoidance of activity, which subsequently hastens deconditioning and weight gain," Carter said. "As the benefits of habitual exercise are largely known, we're interested in determining whether we can optimize the exercise stimulus for a given effort." "High-intensity interval exercise has been employed to elicit such effects, yet this approach may not be initially appropriate given the high prevalence of comorbid conditions among breast cancer survivors," he said. Following a battery of baseline tests, participants randomized to the "altitude group" are asked to perform a systematic, eight-week exercise training regimen in hypoxic conditions (≈16 percent oxygen) while the "control group" performs exercise under normal conditions (≈21 percent oxygen). 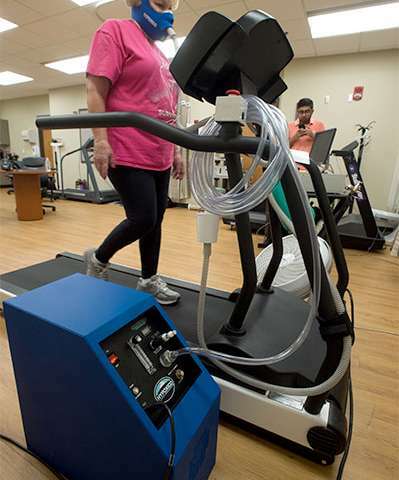 To simulate a higher altitude, participants are outfitted with an exercise mask connected to a commercial grade hypoxic generator that rarifies room air. A light-weight corrugated tube from the generator is connected to the exercise mask, which is secured over the participant's mouth and nose with neoprene straps and does not impede the participant's ability to speak. The two groups follow the same exercise progression based on the heart rate reserve method. "In hypoxic conditions, the resulting decrease in blood oxygen saturation upregulates the cardiovascular system to maintain appropriate tissue perfusion and ensure oxygen delivery matches oxygen demands," Carter said. "This approach allows the altitude group to walk at slower speeds, which is believed to mitigate joint discomfort and local muscle fatigue." More information: To find out more information about how to participate in this clinical trial, please contact the UAB Exercise and Cancer Research Team at 205-975-0269 or moveforward@uab.edu.